It looks like The Comics Journal will be profiling Jaime Hernandez on the occasion of his stunning comics in Love & Rockets: New Stories #4. Dan Nadel has a piece up here; Frank Santoro and Adrian Tomine chime in here. From the comments it looks like there will be a Jeet Heer article/interview at some point this week as well. It's satisfying to see a magazine like TCJ fostering discussion of a great comic, and somewhat alarming to see two tired Internet constructions almost immediately rear their head: whether or not Dave Sim did things similar to what Hernandez has done and what this might say about the ongoing dysfunctional drama that is the comics community's reaction to Sim, and whether or not "The Love Bunglers" is ideally suited or somewhat less so for reaching new readers. Hopefully, TCJ can stay mostly on target for the duration of the discussion. I agree with Nadel, Santoro, Tomine and many of the comment-makers that Jaime Hernandez's new work represents a phenomenal achievement. I'm maybe not as interested in finding its place in the pantheon right this second. There's plenty of time for that down the road. One thing that's exciting and should never be denied about a creative achievement on the level of what Hernandez seems to have given us here is what that work might say to us in the future that it doesn't say right now. 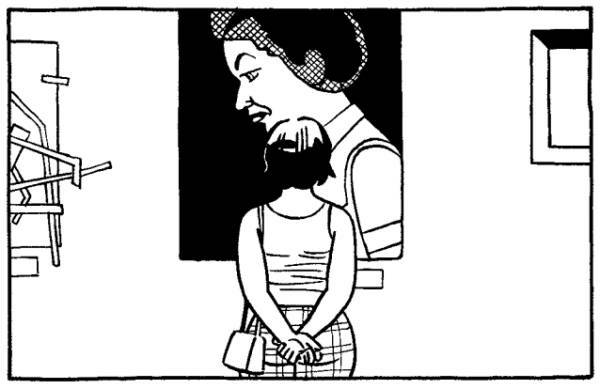 Even with someone like Hernandez, whose comics have always come to an audience in a serial form that stresses each work's immediacy and currency, the newer pieces and our accrued experiences change what we think of the already-existing comics. I know for a fact that "The Love Bunglers" will be a different comic five years from now, and everything I know about comics suggests it stands a good chance of being a greater one. What seems far more important to me than making a forceful claim on these comics' behalf is endorsing Hernandez and his work as vital items of wide-ranging discussion and debate. Talking about great works shouldn't ever need to justify itself, yet we do far too little of it in comics. At the same time, it's clear that Hernandez rolling out this affecting a story at this point in his career triggers a host of potential, additional, valuable conversations. He's a founding member of a phenomenal group of cartoonists that emerged in the 1980s and into the early 1990s that due to the way the industry is constructed in a financial sense now we may never see again. That seems worth noting. The fact that Hernandez has been making great and near-great work for almost 30 years now -- with no end in sight -- with alarming consistency I'd suggest places him in a rare class of pantheon-level comics makers, the titans of the most-lauded newspaper strips and the very finest craftspeople that expressed themselves through various enterprises in mainstream funnybooks. As many point out over at TCJ, this longevity enhances the appeal of Hernandez's work, part of the cartoonist's vastly undervalued skill at making the best of different formats and presentations (neither of the last two issues' worth of Hernandez's comics would have hit as hard spread out over several serial comic books). With their largely humane themes -- the power of memory to control our present, the heartbreak of sudden violence, the struggle to overcome one's own emotional limitations when negotiating them no longer seems possible -- Hernandez's comics are in many ways an antidote to all the things that drive comics fans nuts despite their seeming appetite for wallowing in such things for weeks, months, years on end. Sexism in comics is always worth fighting because sexism is pernicious and harmful and thus worth calling into question every time it's encountered, but for many adult fans part of the solution really is to put down the terrible comic that enrages you and buy something like Love & Rockets: New Stories #4 for its fragile, sympathetic portraits of a wide range of human experiences. Jaime Hernandez is also an unparalleled craftsman, one of the last to combine a hard-won set of uncompromising values regarding the execution of comics pages with the number of pages accomplished necessary to become one of those touchstones himself. His work speaks to the distressing shallowness of boiling comics down to concepts and ideas that can be sold into other media in a way that flatters those writers that best stand to benefit. His line work crackles with meaning and import. An additional thing that strikes me when you look at Jaime Hernandez's career, something with implications for the field entire, is how rare his kind of sustained, idiosyncratic expression has become in an art form where once upon a time it seemed the value of finding the one major vehicle for your life's work was something so clearly understood it almost didn't get discussed. Much has been and will be made as to how these new Jaime Hernandez comics call on plots and characters and narratives from years gone by. That's not a criticism. We can't let that be a criticism. Let me suggest that it's outright bracing to read a cartoonist that isn't negotiating with a perceived, ideal readership but simply making the comics he wants to make as great as he can make them. God bless any cartoonist -- any artist -- that in following their creative impulses chooses to ignore the growing chorus of bleats that art be made easy and meet us not at our point of need but however it's easiest for us to gobble it up. At this point in the remarkable career of Jaime Hernandez, we should all be doing whatever it takes to get to him, not the other way around. It's a privilege to be reading, writing and thinking about comics while he's in the process of making them.